I have violin lessons on Tuesdays, and I hate to go into them "cold", so I made sure I practiced this afternoon. I haven't been as consistent with my playing since December, due to holidays and an erratic lesson schedule. Now that I've settled into a regular lesson schedule, I'll find time to play every day. I started playing in 3rd grade and took a 22 year "sabbatical" starting in college. I did retain my basic skills, but I'm sure my fingers were much faster in 1986. But not a big deal - I still enjoy the process of creating music through my violin again. AWESOME! I'm a Frech Horn player, so I can totally appreciate this post. Way to go and the color to your violin is gorgeous! What a lovely hobby to have. I am in awe of anyone who can create music! That's a lovely shot...and the color is fabulous too! Hope you had a good lesson. JUST STUNNING. I love the perspective, color, and crop you decided to go with on this photo. 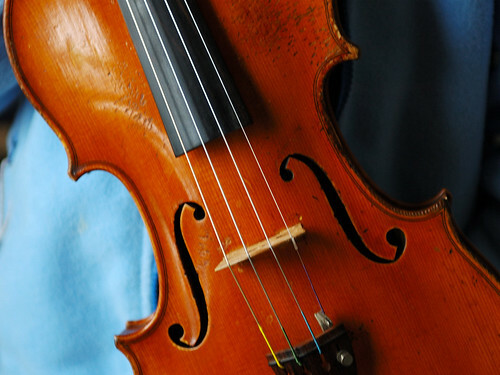 The curves of the violin are gorgeous. So awesome that you play violin!! Such a beautiful instrument! Love your cropping and the colors of your shot! Beautiful. I am always jealous of people with some kind of muscial talent. I love music but am not musical in anyway. Such a great composition! Love it. I think that's great that you play the violin! Great capture! Love the composition and the colors. I've always wished I'd learned an instrument. great shot. It makes me want to get out my flute and play awhile. Oh wow, what a great hobby. It's so awesome that you picked it back up too.